Right-of-way laws in Wyoming are in place so that people know who has to stop at an intersection, and who can proceed. The law does not specify who has the right of way, only who must give it in certain circumstances. Right-of-way laws are in place because not everyone behaves in accordance with common sense. It has to be defined in law so that everyone understands what they are required to do. When approaching an intersection that has no signals or traffic signs, you must yield the right of way to the first person in the intersection, and then to the motorist on the right. When turning in an unmarked intersection, you must always yield to through traffic. Even if you have the apparent right of way, you must still yield to any vehicle that is close enough that if you fail to yield an accident could occur. When approaching a roundabout, you must always yield to pedestrians and to traffic that is already in the circle. You will know when an emergency vehicle is approaching, because you will hear a siren or see flashing lights. When this happens, you have to pull over and yield the right of way. Do not stop if you are already in the intersection. Move on, and then once you have cleared the intersection and can safely pull over, do so. You must yield to a pedestrian in a crosswalk, whether it is marked or unmarked. If you are making a legal right turn on a red light, you must first check for pedestrians, and if they are in the crosswalk on your half of the road, you must give them the right of way. Blind pedestrians always have the legal right of way. They can cross in ways that would be a violation and subject to a fine if done by a sighted pedestrian. You can identify a blind pedestrian by the use of a white cane or the presence of a guide dog. Many motorists believe that pedestrians essentially get a “free pass.” This is not actually true. 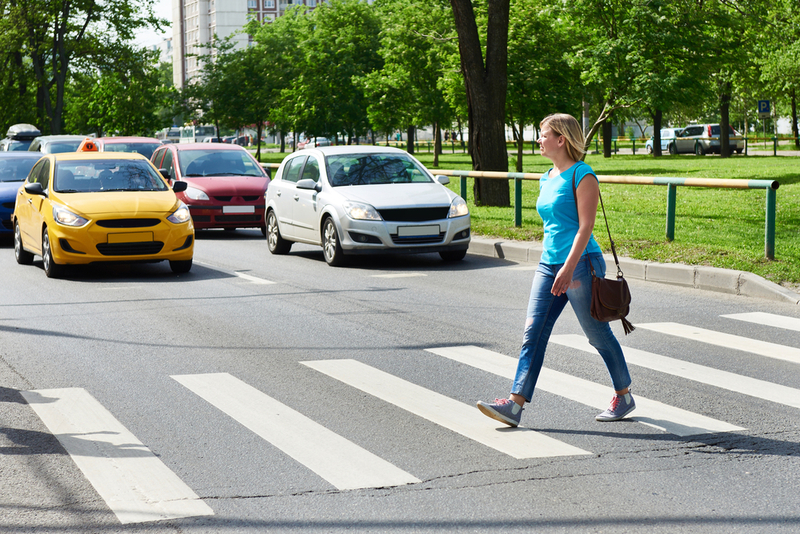 A pedestrian who crosses against a light or jaywalks, thereby impeding the flow of traffic, can be charged with failure to yield the right of way. However, public safety always trumps individual rights, so even if a pedestrian is clearly in violation, you have to yield the right of way. In Wyoming, there is no points system, but violations are recorded on your driving record. If you fail to yield the right of way, you can be given a fine of anywhere from $100 to $750, depending on the seriousness of the violation. For further information, refer to Wyoming Rules of the Road, pages 41-48.